Includes 1 chair in random color (blue or brown), for children ages 2-6 and not more than 125 pounds. Approximate Item Dimensions: Seat Measurements: 11 inches high, 11 inches deep, 14 inches wide, 25 inches wide at the widest point (arm rests), 24 inches tall overall, Back: 13 inches wide, 13 inches high. 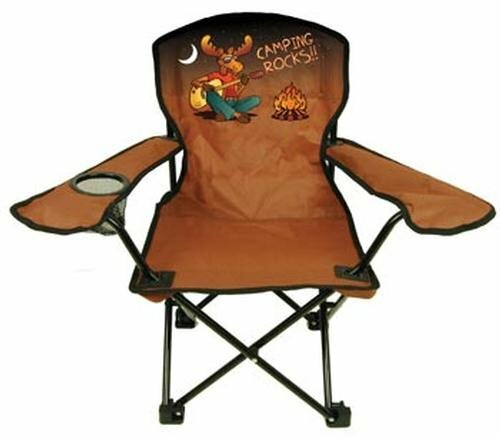 Features a moose design on a durable nylon fabric, with mesh cup holder in arm rest, includes matching carry back. This kids chair meets all new standards for childrens furniture safety, including phthalate free fabric with locking leg system. If you have any questions about this product by Children Folding Chair, contact us by completing and submitting the form below. If you are looking for a specif part number, please include it with your message.